Heating and cooling can account for about 40% of your energy use. The typical South Australian home uses more energy for heating than cooling. Heating your home efficiently can help save you energy costs. Reducing the amount of heating you need to stay comfortable can be as easy as making some simple and practical changes. Set your heater’s thermostat to 18–21oC or as low as you feel comfortable with. Every degree lower may reduce the running costs by up to 10%. Choose the best heater for your needs based on the size of the area you need to heat. A heating specialist can help you with this decision. Adjust your heater’s louvres towards the floor, as hot air rises. Keep any louvre blades dust free and clean filters regularly. Open curtains and blinds during the day and move anything blocking the light, such as external shading. Tiled or concrete floors can store warmth from the sun and help warm the home into the evening. Shut curtains and blinds at night time to help keep the warmth in. The larger the area you heat, the more energy you will use. Divide your home into sections or zones by closing doors and, if you have a ducted heating system with zone controllers, turn off rooms that are not in use. Insulation reduces the amount of heat transferred into or out of your home through the ceiling, walls, floors, doors and windows. 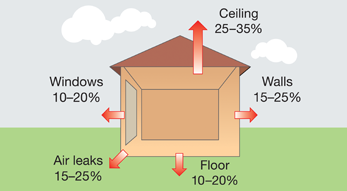 In winter, up to 60% of your heating could be lost through your ceilings and walls if you don’t have insulation. If you don’t have ceiling insulation, consider having it installed. If you rent, ask your landlord if they will install it. Insulation can deteriorate over time, so ensure it is replaced or topped up when it’s no longer effective. Up to 20% of your heating could be lost through your windows. Thick curtains and pelmets are an effective way of insulating your windows to help keep your rooms warmer. Cracks and gaps in a home, such as those around doors and windows, can cause draughts and a lot of heat loss from your home. You can make simple changes like using draught excluders under doors (such as door snakes), sealing strips around door and window frames, and filling gaps to help reduce your heating costs. If you are using a gas heater, see ventilation for gas appliances to make sure you are using your heater safely. Heaters work in different ways and use different amounts of energy. Choosing the best heater for your needs can help you lower your energy use and running costs. Be aware that portable heaters, such as oil, column and fan heaters, might be cheap to buy but can be very expensive to run and ineffective if used in larger areas. If a portable heater is your only option, you can lower your running costs and make it work more efficiently by reducing the size of the area you’re trying to heat. Rather than trying to heat a whole area, consider using a radiant heater or electric heated rug to heat you directly. The table below provides a range of options for heaters to use in different settings and an approximate running cost for each type. The examples are only a guide and will differ depending on the size and efficiency of your appliance, how big the area is you are heating, what the thermostat of the appliance is set to, and whether your home is insulated and draught-proofed. You can get a more accurate idea of how much your heater costs you to run by calculating your running costs or using a plug-in power meter, which you can borrow free of charge as part of a Home Energy Toolkit. Note: Estimated running costs are based on the AGL electricity and Origin Energy standing retail contracts. For further methodology information, please contact the Energy Advisory Service. You can save on energy use and costs by reducing the amount of heating you need. 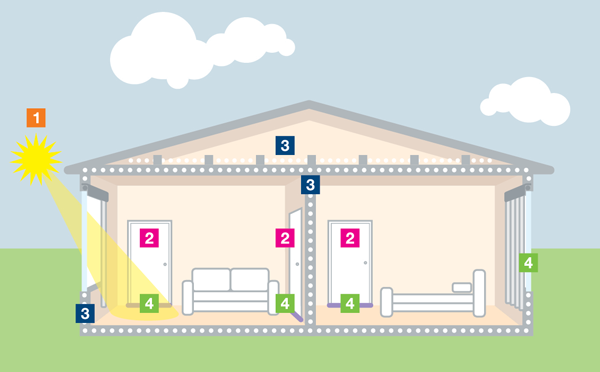 Follow our easy energy saving tips and watch our video for more information. If you are buying a new heater, talk to a heating specialist about the best option for your needs and the costs associated with buying, installing, running and maintaining the heater. For example, if you are thinking about buying a gas heater but don’t have gas connected at your property, you’ll need to consider the gas supply charge as well as the gas used. If you already have gas connected for water heating and cooking, it may be more cost effective to install a gas heater rather than an electric one. Buying a new heater may be a good time to consider your best options for cooling as well. You can use the following table as a rough guide to work out the heat output (in watts or megajoules) needed per square meter of your home or heating area. These figures are based on rooms with 2.4 metre ceilings. Some heaters will have an energy rating label that you can use to compare the energy use and efficiency of smaller appliances. The more stars the better. You can also compare the estimated running costs of new appliances on the Energy Rating website. Don’t leave heaters unattended when they’re operating, as they can cause fires. Keep any flammable materials at least one metre away. Never plug a heater into a power board, double adaptor or extension cord with other appliances, as the connection may overload and cause a fire. Regularly service and maintain your heater according to the manufacturer’s instructions. Check that power cords and plugs are in good condition before plugging them in. If you have a gas heater, make sure there is adequate ventilation to avoid build-up of dangerous combustion gasses. Carbon monoxide is a colourless, odourless and tasteless poisonous gas that is produced when your heater doesn’t burn gas properly. It is very hard to detect and is often called ‘the silent killer’. If you are using a gas heater in your home, check with a licensed gas fitter that the room has adequate ventilation. Gas heaters should be installed and serviced regularly by a licensed gas fitter – ensure you get a certificate of compliance for any work done. Never use outdoor LPG cylinders or gas heaters inside, including camping heaters, as they release dangerous combustion gases and are a high fire risk. Where LPG appliances are used, the gas cylinder should be located outside and the gas supply piped inside by a licensed gas fitter.